I was recently enthralled by Shusaku Endo’s 1966 novel Silence–the best book I’ve read since reading Kristin Lavransdatter last year. It is the story of two Portuguese missionaries, Father Rodrigues and Father Garrpe, who arrive in Japan during a persecution of Japanese Christians. They seek to secretly minister to underground Christian communities and also to recover another Portuguese missionary, Father Ferraira, who is said to have apostatized under torture. Rodrigues is betrayed, arrested, and plunged into a nightmarish dilemma in which the authorities threaten to torture and kill the Japanese Christians unless Rodrigues denies Christ and tramples on a picture of him. Rodrigues commits this terrible act, and then lives out the rest of his life as a prisoner in Japan, never again allowed to practice his Christian faith. The book is currently being adapted as a film by Martin Scorsese. Although I loved the book, and although I generally love Scorsese, I’m dreading the upcoming movie (and not just because the source material is pretty depressing). How do you tell the story of Christian faith? The difficulty, the crisis, of believing? How do you describe the struggle? … Shusaku Endo understood the conflict of faith, the necessity of belief fighting the voice of experience. The voice that always urges the faithful – the questioning faithful – to adapt their beliefs to the world they inhabit, their culture…That’s a paradox, and it can be an extremely painful one: on the face of it, believing and questioning are antithetical. Yet I believe that they go hand in hand. One nourishes the other. Questioning may lead to great loneliness, but if it co-exists with faith – true faith, abiding faith – it can end in the most joyful sense of communion. It’s this painful, paradoxical passage – from certainty to doubt to loneliness to communion – that Endo understands so well, and renders so clearly, carefully and beautifully in Silence. I’m not entirely sure what Scorsese means by this comment, but he seems to take a positive view of Rodrigues’ apostasy–that it was all a part of “questioning one’s faith,” a necessary stage on the journey to maturity. Endo, however, clearly doesn’t portray apostasy favorably. Rodrigues’ decision to apostatize is based in a false mercy, the mercy of the Grand Inquisior, which holds bodily necessity to be so fundamental that it merits cooperation with evil. By denying the spiritual needs of man, this false mercy ultimately corrupts and destroys the humanity that it wishes to preserve. After denying Christ, Rodrigues knows that he carries “a deep wound” and he continues to cooperate with the evil government, even helping them apprehend more Christians. He finds himself on “a slope down which he kept slipping endlessly. To resist, to refuse–this was no longer possible” (279). Though he begs for mercy on behalf of those Christians, his pleas are to no avail: he has lost any moral authority that might have commanded respect, and the government ignores his pleas. The situation is a powerful demonstration of Romans 3:8: “Why not say—as some slanderously claim that we say—’Let us do evil that good may result’? Their condemnation is just!” It is Garrpe’s choice, not Rodrigues’, which Endo admires–Garrpe, who will not apostatize even to save the other Christians, but who dies trying to save them himself. Rodrigues’ apostasy dramatizes the gulf between himself and his Creator, and hence glorifies God by highlighting man’s utter dependance on him. Rodrigues had hoped to compensate for God’s inaction by rewriting moral law and taking action on his own; but his action utterly failed to have good effects, leaving him broken and humbled. Near the end of the novel, Rodrigues finds a newfound connection with Kichijiro, whom in his pride he had previously scorned, for he has realized that he himself is as weak as Kichijiro: “there are neither the strong nor the weak” (285). Even though sin corrupts the sinner and alienates him from God, it can, once committed, serve as a reminder of his weakness. God’s very absence amidst our brokenness testifies to our need for him–but only if we humble our pride and confess our weakness. I am not sure Scorsese’s film will reflect man’s need for God, since his interpretation seems to be the standard liberal one that doubt and even sin are normal, healthy processes. Second, Scorsese’s talents simply aren’t suited to the novel. He’s a very good genre filmmaker, but when he strays outside the crime genre, the results range from the technically-accomplished-but-forgettable (Shutter Island, The Age of Innocence, Kundun, The Aviator) to the failures–often interesting failures, but failures nonetheless (Last Temptation of Christ, Bringing Out the Dead). Unfortunately, I can’t think of any living filmmaker who would do a better job with the material. There are plenty of directors who could effectively portray the grotesque and despairing aspects of the novel (Lars von Triers, Takeshi Miike, Bela Tarr) but wouldn’t capture its spiritual depths. Although I often enjoy literary adaptations, I wish this particular novel would remain in the realm of the unfilmable. Chantal Howard’s The School of the Family makes a much-needed attempt to apply theological treatises on family spirituality—such as Pope John Paul II’s Letter to Families and Fulton Sheen’s Three to Get Married—to the often murky, often maddening, reality of everyday family life. For instance, it’s all well and good for Pope John Paul II to praise marriage as a “total gift of self,” but what does that really mean when we’re married to a nonbeliever (as her grandmother was), or we’re healing from a broken past (as her parents were), or we’ve got multiple kids pawing at us and whining just as we wanted to sneak out the door for adoration? Mrs. Howard’s book is full of charming anecdotes that show us just what we can do in such situations. For instance, Mrs. Howard’s father taught her the Jesus Prayer when he was fed up with her six-year-old’s prattle and wanted to encourage her to be quiet. Her grandmother used to jot down thoughts about Imitation of Christ on the back of her grocery lists. Mrs. Howard has created a “rule” for her own family—the details of which you can read in the book–to keep them spiritually centered even when life gets chaotic. Unfortunately, the book’s greatest strength can at times be a weakness. I found the story of Mrs. Howard’s family to be highly instructive whenever it resonated with something in my own life—but then, there were parts I found less compelling (such as her life as a teenage athlete), simply because I couldn’t identify them with any of the struggles I myself experience. I think that the book’s appeal may vary based on the reader’s own experiences. Another downside to the book—which I think is a more serious one—is that, while its approach to spiritual formation is mostly sound, it urges a haphazard approach to academic education. The book criticizes public education and advocates homeschooling—a noble cause, though her silence on the subject of Catholic schools and her simplified public-school-versus-homeschool dichotomy is a disservice to the reader. Moreover, her vision of homeschooling seems to lack academic content. Howard, who was homeschooled, admits that “there were certainly areas of my education that fell through the cracks” because her mother was too busy running a business to pay much attention to her schoolwork (55). Now a homeschooling mother herself, she seems to have little interest in attending college. She breezily dismisses the idea that parents should first learn the subjects that they want to teach their own children: “we don’t know the classics, let alone how to pronounce many of the names of the great minds into which we wish our children to delve” (64). As a former college instructor (now housewife), I can attest to the fact that such a method would never have worked for me. I didn’t feel ready to teach my own field until I had studied it for years. Some may argue that teacher and pupil can learn together—that both teacher and student can ask questions and research the answers as a team. However, without a base level of knowledge, the teacher probably won’t know the best resources to answer those questions—or even know the right questions to ask. The easiest way to attain this base level of knowledge is through earning a postsecondary degree. Cognitive psychologists have shown that people retain information best when they are tested on it, when they discuss it with others, and when they put it into their own words—which is exactly what people do in the college classroom (take exams, engage in class discussions, and write papers). It is difficult to replicate this experience simply by reading books on one’s own, without direction and community. Of course, not everybody is in a position to obtain a quality college education. Many universities nowadays are woefully inadequate—or even actively hostile—to the task of transmitting the Western heritage. But there are still some genuine opportunities for learning. Some Catholic colleges such as Franciscan University pride themselves on actually teaching students instead of indoctrinating them into moral relativism and intellectual mediocrity. If a person cannot obtain scholarships to these colleges, he or she may still be able to get a debt-free degree at a community college. I took community college classes in high school, and I think they’re a fine alternative to universities. In some ways, they are less rigorous—I certainly didn’t write any 15-page research papers in community college—but, in other ways, they are more rigorous. Take a look at many universities’ humanities courses, and you’ll see a lot of fluff: Literature and the Occult, Deconstructing the Comic Book, etc. In contrast, my community college offered two “upper-level” humanities courses: Western Humanities I and Western Humanities II. In those classes, we learned only the basics; but many university students won’t learn even that. This is not to say that a person can’t homeschool effectively without a college degree—only that it will be more difficult. We should find ways to support homeschooling mothers who need to attend college, not actively discourage them or belittle their concern for academic rigor. Ultimately, The School of the Family excels at its most important task: offering spiritual guidance to families through telling of one family’s example. While I object to some of its statements on academic formation, I think its teachings on spiritual formation are definitely sound. Sigrid Undset is best known for Kristin Lavransdatter, which is weighty and detailed enough to serve as a life’s work. But she also wrote more novels—most notably the Master of Hestviken tetralogy–and several hagiographies. 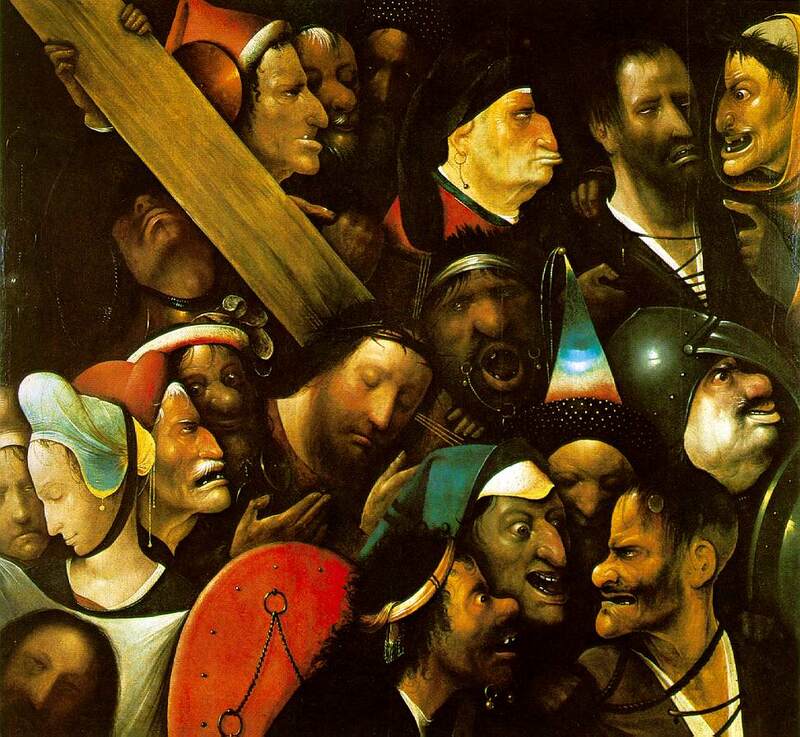 In artistic depictions by Angelico or Bosch or Grunewald, Christ’s tormentors are less than human, their faces twisted into hideous masks of mockery and spite. This depiction illustrates an important spiritual truth–that we are degraded by sin, and that every kind of sin and weakness is found among the executioners in the Passion story (cowardice, apathy, bloodlust, greed, political manipulation). But it obscures an equally important truth–that Christ loved them nonetheless, that they were his Father’s beloved children. I can’t imagine a worse fate than to suffer at the hands of one’s children or spouse. What if my daughter were to grow up evil, what if she stole from me, tormented me, mocked me to her friends? Any material suffering she would cause me in such a scenario would pale in comparison to the suffering caused by my helpless, rejected love for her. So yes, Christ’s tormentors had ugliness in their souls. But Christ also saw the spark of goodness and beauty in them–the spark that he came to save, but which would dwindle and die out unless they they allowed him to tend it. I wish I could love all my enemies in such a way. I just finished reading all 1124 pages of the Norwegian epic novel Kristin Lavransdatter. And yet, despite its length, to call it an epic seems almost a misnomer. Set in the Middle Ages, it simply tells the tale of one woman’s life, from birth to death–a woman who is not particularly high-born, whose life is never touched by war, and who sees the king only once. Of course, it’s the Middle Ages, so the book is crowded with misfortunes: men are constantly swinging war-hammers at each other over petty disputes; children’s lives are carried off by illness and accident, while adults futilely apply poultices of herbs and folk wisdom; and, just when you think the characters have achieved a modicum of peace and contentment, the Black Plague strikes. But these are, for the most part, ordinary and random misfortunes–and, in fact, the most ordinary ones, like a difficult childbirth, or an ill-fated sexual sin, are the most gripping. I feel much as Dorothy Parker did after attending a play by Leo Tolstoy: “I went into the Plymouth Theater a comparatively young woman, and I staggered out of it, three hours later, twenty years older, haggard and broken with suffering” (Portable Dorothy Parker 1976, 419). I don’t know if I would say I “liked” Kristin Lavransdatter. But it is an undeniably great and powerful book, and it will probably stay with me much longer than books I enjoyed. Young lovers are horrified to think of their passion dying out. And yet, love, like energy, is always conserved–it is never destroyed, but only changes form. In marriage, the love that once focused myopically on a single person diffuses, spreading outward–to the children, fruit of that love; to the household, visible symbol of the couple’s common good; to the in-laws, the people responsible for shaping the loved one; to one’s own parents, who are easier to appreciate and understand after experiencing the vicissitudes of marriage. In dating, the world is emotionally saturated with the loved one; in marriage, the world is physically saturated with him. Is love diminished when it spreads to encompass these new physical signs such as children and household? I don’t think so, because they are all aspects of the loved one and of the marriage bond, just as the persons of the Trinity are all aspects of the same God. But one of the greatest tragedies of the novel is that Erlend doesn’t want this changed, diffused kind of love: “it was not the way he wanted to be loved. But she couldn’t help it; it was her nature to love with great toil and care” (2005, 989). Near the end of their marriage, they reach an impasse. He withdraws to a cabin in the mountains and waits for her to come to him, so they can be free of the quotidian dullness of farming and parenting and respectability. She waits for him to come to her on their estate, so that he can take responsibility for their new child. Each is waiting for the other, too proud to bridge the gap between their vastly differing views of a happy marriage. Meanwhile, the personal sin between Erlend and Kristin–their sexual sin and blood guilt, in addition to the thousands of petty sins like anger and pride that accumulate over time–has tarnished their relationship. But the greatest sin is Kristin’s inability to forgive Erlend: “she herself had raged, storing away and brooding over every grief, whenever she offered her gifts and Erlend paid them no mind” (2005, 915). It is only near the end of her life that Kristin truly forgives Erlend for all the grief he caused her (and for the grief she has caused him–for, as the book points out, it is sometimes harder to forgive our creditors than our debtors). It is a hard-won lesson, worked out with fear and trembling. I hope most married people–myself included–can learn it sooner. Lent and Advent are my two favorite times of the liturgical year. Both are seasons of anticipation, calling us to reflect on the mysteries we are preparing to celebrate, and to purify ourselves so as to be worthier of them. The guidelines for Lent are a bit more clear-cut. During Lent, we fast and give alms, receive ashes on our foreheads, partake in the sacrament of reconciliation. Without a major holiday to prepare for–Easter has largely resisted commercialization, except for the occasional chocolate bunny–and with the rough weather of March to force us inward, we’re generally pretty good at reflecting and repenting. But Advent seems to have fewer traditions, so it’s easier to get distracted during this season, especially with the flurry of Christmas shopping, holiday parties, and travel plans. I think one good way to focus on preparing for Christ’s birth–apart from the obligatory Advent wreath and calendar–is to find a good Advent-themed book and work through it. For many people, Matthew Kelly’s book Rediscover Advent will serve that role. For each day of Advent, the book offers one of the daily Mass readings, a short reflection on the reading, a meditation question, and a prayer. (There’s one prayer per week, repeated on each day of that week). The meditations are the main attraction of the book. I haven’t read all of them yet–I don’t want to spoil my Advent surprises–but the ones I’ve looked at seem relevant. They reiterate the same points that all Christians know, but so few of us do. For instance, the reflection for Monday of the fourth week of Advent says: “If you can tell me what your habits are, I can tell you what sort of person you are . . . Our lives change when our habits change.” I know by hard-won experience that my thoughts are more easily directed towards God when I arrange the outward details of my life such that I’m forced to think of Him, rather than waiting for a spontaneous inclination towards prayer. The solution is so simple, but also so easy to neglect. God of hope, I look to you with an open heart and yearning spirit. During this Advent season, I will keep alert and awake, listening for your word and keeping your precepts. My hope is in you, as I wait to celebrate the birth of Jesus. In my opinion. the best way to enter fully into a liturgical season is to attend daily Mass and pray the Liturgy of the Hours. But if you haven’t the time to do that–or if you’re already doing that, but want to do something more for Advent–this little book might offer just the solution. I wrote this review of Rediscover Advent for the free Catholic Book review program created by Aquinas and More Catholic Goods.